I saw Atsuko Hirayanagi‘s short film Oh Lucy! back in 2014 and thought it to be a bona fide charmer. It told the story of a lonely woman named Setsuko who does her niece a favor by recouping the cost of English classes the cash-strapped girl had decided quit. The American teacher was an eccentric who used wigs and fake names to allow ‘Lucy’ to disappear into a new, more candid version of her buttoned-up self. It’s a whirlwind of emotions when the teacher goes back home—enough that Setsuko allows her newfound lack of inhibition to bleed into her everyday life. We laugh at her confidence and stark truth, becoming inspired by her reinvention and much-needed awakening from the depression that had all but consumed her whole. 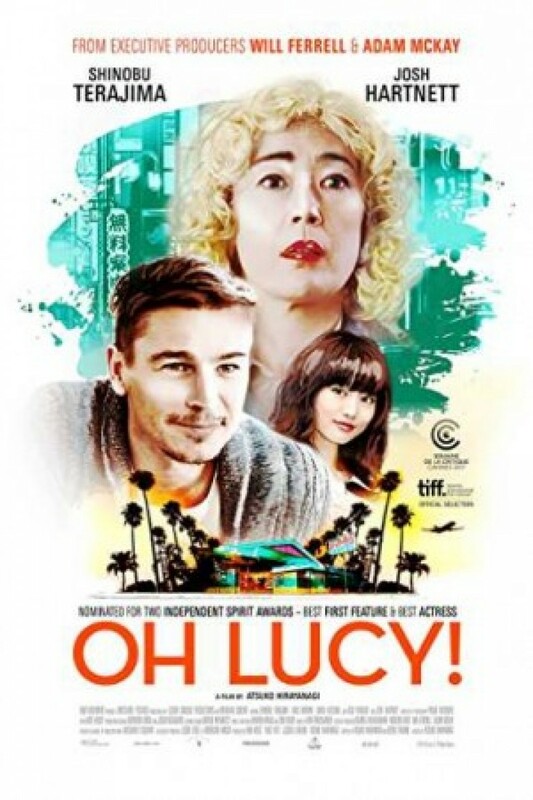 Discovering that Hirayanagi had adapted the piece (alongside cowriter Boris Frumin) into a feature length film produced in part by Will Ferrell and Adam McKay of course led me to believe this new Oh Lucy! would embrace that inherent comedy and take it even further. Now having seen it, I couldn’t be happier to discover this was the exact opposite of what happened. Everything that was there in the short remains—the first twenty or so minutes is actually very close to an exact replica on the surface with additional depth and purpose infused beneath. The result proves a melancholic adventure across the Pacific dealing with betrayal, sexuality, apathy, love, and suicide. What had been a sweetly told lark suddenly became a profoundly poignant depiction of loneliness’ grip. 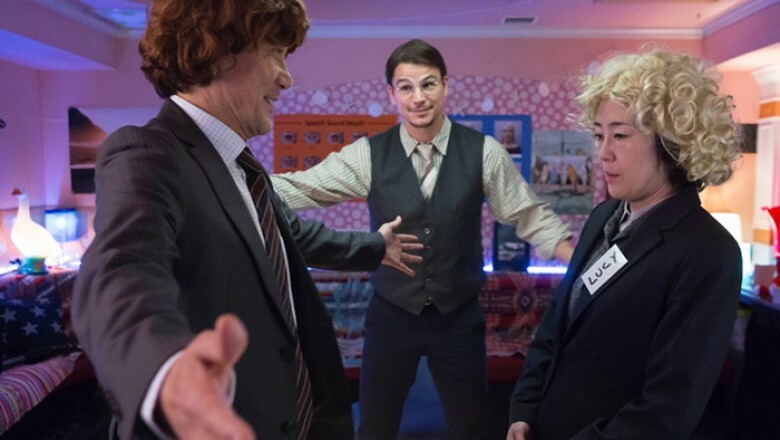 Setsuko (Shinobu Terajima) decides to go to California because her English teacher (Josh Hartnett‘s John) went there with her niece (Shioli Kutsuna‘s Mika). She buys a ticket to go after her (well, mostly him thanks to a friendly persona she takes to mean more) and the girl’s mother (Kaho Minami‘s Ayako) tags along. This is great because these two sisters are estranged at best, filled with hate at worst. It leads to authentic laughs whenever they meet someone new because these unsuspecting Americans don’t know what’s coming. But it’s also important for the underlying complexities behind why Setsuko and Ayako are how they are. Add a self-aware cognizance to Japanese culture’s role in helping to mold them and you’ll find ample room for both humor and hardship alike. So while we do get a wonderfully funny fish-out-of-water story with Setsuko breaking free from her shell and John never being quite transparent with either her or Ayako, there’s also a resonant glimpse at familial struggle, the generational divide, and mid-life crises. We learn to adore Setsuko’s ‘Lucy’ because she is up for anything—perhaps too much—while also acknowledging the danger of her over-compensation. She had just watched a coworker with the identical job responsibilities as hers retire in tears because the office was her entire world. She practically looked into a crystal ball at her own future and chose to take a stand without fully realizing the ramifications of that decision or the risks involved if her fantasies didn’t quite play out. It’s a slippery slope. But Terajima is up for the job. She deftly moves between worlds as the meekly polite wallflower slowly being coaxed out into the open and the throw-caution-to-the-wind creature free from convention and judgment. It’s night and day watching her interactions with a fellow classmate in ‘Tom’ (Kôji Yakusho) against those with John. There’s an intrinsic awkwardness with the former as though she’s being forced to hold back by millennia of tradition and responsibilities. With John, though, there are no expectations. She’s allowed to let loose without reservation, his presence a reprieve from the role she thought she had no choice but to accept. And every step forward in California emboldens that bravery. Soon she’s acting on impulse to gain unquantifiable pleasure as well as unavoidable pain. Oh Lucy! utilizes familiar middle-aged identity crisis tropes and yet nothing about it feels familiar thanks to the care Hirayanagi takes in reflecting the process from an eastern perspective. We laugh at the concept here, joking about extra-marital affairs and sports cars. We make light of what it means to succumb to stress and seek escape because it’s fun to giggle at balding men in corvettes with blonde women half their age hanging off their arms. That’s not the aftermath of such struggles in Japan, though. Suicide is a national issue for the country, one whose rate is higher than most if not all other “advanced” societies around the world. It’s therefore a prevalent issue in the film too, arriving with gallows humor to expose the suffering underneath. It’s by no means a “message” movie, though. It’s merely honest about what its characters go through. So it’s not abrupt when the farce of John chauffeuring Setsuko and Ayako around San Diego morphs into a complex drama of bad decisions and petty attempts at unearned superiority. Nothing that occurs feels unnatural either. Revelations about Setsuko’s desires or Ayako’s and John’s secrets enter with purpose to explain the sadness in everyone’s eyes despite the smiles upon their faces. Harnett delivers one of his best performances in the process and yet Minami and Terajima constantly prove how he’s the outsider in this tale rather than them. Terajima’s ‘Lucy’ magnificently wields the full spectrum of emotions to deliver an imperfect character that’s broken yet still willing and able to heal.